Emily Carr (December 13, 1871 – March 2, 1945) was a Canadian artist and writer inspired by the Indigenous peoples of the Pacific Northwest Coast. One of the first painters in Canada to adopt a Modernist and Post-Impressionist painting style, Carr did not receive widespread recognition for her work until the subject matter of her painting shifted from aboriginal themes to landscapes—forest scenes in particular. As a writer, Carr was one of the earliest chroniclers of life in British Columbia. The Canadian Encyclopedia describes her as a "Canadian icon". Born in Victoria, British Columbia, in 1871, the year British Columbia joined Canada, Emily Carr was the second-youngest of nine children born to English parents Richard and Emily (Saunders) Carr. The Carr home was on Birdcage Walk (now Government Street), in the James Bay district of Victoria, a short distance from the legislative buildings (nicknamed the 'Birdcages') and the town itself. The Carr children were raised on English tradition. Richard Carr, born in England, believed it was sensible to live on Vancouver Island, a colony of Great Britain, where he could practice English customs and continue his British citizenship. The family home was made up in lavish English fashion, with high ceilings, ornate mouldings, and a parlour. Carr was taught in the Presbyterian tradition, with Sunday morning prayers and evening Bible readings. Richard Carr called on one child per week to recite the sermon, and Emily consistently had trouble reciting it. Carr's mother died in 1886, and her father died in 1888. Her oldest sister Edith Carr became the guardian of the rest of the children. Carr's father encouraged her artistic inclinations, but it was only in 1890, after her parents' deaths, that Carr pursued her art seriously. She studied at the San Francisco Art Institute for two years (1890–1892) before returning to Victoria. In 1899 Carr traveled to London, where she studied at the Westminster School of Art. Carr also visited the Nootka Indian mission at Ucluelet on the west coast of Vancouver Island in 1898. She traveled also to a rural art colony in St Ives, Cornwall, returning to British Columbia in 1905. Carr took a teaching position in Vancouver at the 'Ladies Art Club' that she held for no longer than a month – she was unpopular amongst her students due to her rude behaviour of smoking and cursing at them in class, and the students began to boycott her courses. In 1898, at age 27, Carr made the first of several sketching and painting trips to aboriginal villages. She stayed in a village near Ucluelet on the west coast of Vancouver Island, home to the Nuu-chah-nulth people, then commonly known to English-speaking people as 'Nootka'. Carr recalled that her time in Ucluelet made "a lasting impression on me". Her interest in indigenous life was reinforced by a trip to Alaska nine years later with her sister Alice. In 1912, Carr took a sketching trip to Indian villages in Haida Gwaii, the Upper Skeena River, and Alert Bay. Determined to further her knowledge of the age's evolving artistic trends, in 1910 Carr returned to Europe to study at the Académie Colarossi in Paris. In Montparnasse with her sister Alice, Emily Carr met modernist painter Harry Gibb with a letter of introduction. Upon viewing his work, she and her sister were shocked and intrigued by his use of distortion and vibrant colour; she wrote: "Mr Gibb's landscapes and still life delighted me — brilliant, luscious, clean. Against the distortion of his nudes I felt revolt." Carr's study with Gibb and his techniques shaped and influenced her style of painting, and she adopted a vibrant colour palette rather than continuing with the pastel colours of her earlier British training. Carr was greatly influenced by the Post-Impressionists and the Fauvists she met and studied with in France. After returning home in 1912, she organized an exhibition in her studio of seventy watercolours and oils representative of her time there. She was the first artist to introduce Fauvism to Vancouver. Cumshewa seems always to drip, always to be blurred with mist, its foliage always to hang wet-heavy ... these strong young trees ... grew up round the dilapidated old raven, sheltering him from the tearing winds now that he was old and rotting ... the memory of Cumshewa is of a great lonesomeness smothered in a blur of rain. Emily Carr, Klee Wyck. I glory in our wonderful west and I hope to leave behind me some of the relics of its first primitive greatness. These things should be to us Canadians what the ancient Briton's relics are to the English. Only a few more years and they will be gone forever into silent nothingness and I would gather my collection together before they are forever past. While there was some positive reaction to her work, even in the new 'French' style, Carr perceived that Vancouver's reaction to her work and new style was not positive enough to support her career. She recounted as much in her book Growing Pains. She was determined to give up teaching and working in Vancouver, and in 1913 she returned to Victoria, where several of her sisters still lived. During the next 15 years, Carr did little painting. She ran a boarding house known as the 'House of All Sorts'. It was the namesake and provided source material for her later book. With her financial circumstances straitened and her life in Victoria circumscribed, Carr painted a few works in this period drawn from local scenes: the cliffs at Dallas Road, the trees in Beacon Hill Park. Her own assessment of the period was that she had ceased to paint, which was not strictly true, although "[a]rt had ceased to be the primary drive of her life." Over time Carr's work came to the attention of several influential and supportive people, including Marius Barbeau, a prominent ethnologist at the National Museum in Ottawa. Barbeau in turn persuaded Eric Brown, Director of Canada's National Gallery, to visit Carr in 1927. Brown invited Carr to exhibit her work at the National Gallery as part of an exhibition on West Coast aboriginal art. Carr sent 26 oil paintings east, along with samples of her pottery and rugs with indigenous designs. The exhibit, which also included works by Edwin Holgate and A.Y. Jackson, traveled to Toronto and Montreal. Carr continued to travel throughout the late 1920s and 1930s away from Victoria. Her last trip north was in the summer of 1928, when she visited the Nass and Skeena rivers, as well Haida Gwaii, formerly known as the Queen Charlotte Islands. She also travelled to Friendly Cove and the northeast coast of Vancouver Island, and then up to Lillooet in 1933. Recognition of her work grew steadily, and her work was exhibited in London, Paris, Washington, DC, and Amsterdam, as well as major Canadian cities. Carr held her first solo show in eastern Canada in 1935 at the Women's Art Association of Canada gallery in Toronto. 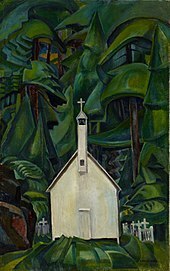 Emily Carr, The Indian Church, 1929. Lawren Harris bought the painting and showcased it in his home. He considered it Carr's best work. It was at the exhibition on West Coast aboriginal art at the National Gallery in 1927 that Carr first met members of the Group of Seven, at that time Canada's most recognized modern painters. Lawren Harris of the Group became a particularly important support: "You are one of us," he told Carr, welcoming her into the ranks of Canada's leading modernists. The encounter ended the artistic isolation of Carr's previous 15 years, leading to one of her most prolific periods, and the creation of many of her most notable works. Through her extensive correspondence with Harris, Carr also became aware of and studied Northern European symbolism. Carr's artistic direction was influenced by the Group, and by Lawren Harris in particular, not only by his work, but also by his belief in Theosophy. Carr struggled to reconcile this with her own conception of God. Carr's “distrust for institutional religion” pervades much of her art. She became influenced by Theosophic thought, like many artists of the time, and began to form a new vision of God as nature. She led a spiritual way of life, rejecting the Church and the religious institution. She painted raw landscapes found in the Canadian wilderness, mystically animated by a greater spirit. In 1924 and 1925, Carr exhibited at the Artists of the Pacific Northwest shows in Seattle, Washington. Fellow exhibitor Mark Tobey came to visit her in Victoria in the autumn of 1928 to teach an advanced course in her studio. Working with Tobey, Carr furthered her understanding of contemporary art, experimenting with Tobey's methods of full-on abstraction and Cubism, but she was reluctant to go to Tobey's extremes. I was not ready for abstraction. I clung to earth and her dear shapes, her density, her herbage, her juice. I wanted her volume and I wanted to hear her throb. Although Carr expressed reluctance about abstraction, the Vancouver Art Gallery, a major curator of Carr's work, records Carr in this period as abandoning the documentary impulse and starting to concentrate instead on capturing the emotional and mythological content embedded in the totemic carvings. She jettisoned her painterly and practiced Post-Impressionist style in favour of creating highly stylized and abstracted geometric forms. Carr suffered a heart attack in 1937, and another in 1939, forcing her to move in with her sister Alice to recover. In 1940 Carr suffered a serious stroke, and in 1942 she had another heart attack. With her ability to travel curtailed, Carr's focus shifted from her painting to her writing. The editorial assistance of Carr's friend Ira Dilworth, a professor of English, enabled Carr to see her own first book, Klee Wyck, published in 1941. Carr was awarded the Governor-General's Award for non-fiction the same year for the work. Paintings from Carr's last decade reveal her growing anxiety about the environmental impact of industry on British Columbia's landscape. Her work from this time reflected her growing concern over industrial logging, its ecological effects and its encroachment on the lives of indigenous people. In her painting Odds and Ends, from 1939 "the cleared land and tree stumps shift the focus from the majestic forestscapes that lured European and American tourists to the West Coast to reveal instead the impact of deforestation." Emily Carr suffered her last heart attack and died on March 2, 1945, at the James Bay Inn in her hometown of Victoria, British Columbia, shortly before she was to have been awarded an honorary doctorate by the University of British Columbia. Carr is buried at Ross Bay Cemetery. Emily Carr is remembered primarily for her painting. She was one of the first artists to attempt to capture the spirit of Canada in a modern style. Previously, Canadian painting had been mostly portraits and representational landscapes. Carr's main themes in her mature work were natives and nature: "native totem poles set in deep forest locations or sites of abandoned native villages" and, later, "the large rhythms of Western forests, driftwood-tossed beaches and expansive skies". She blended these two themes in ways uniquely her own. Her "qualities of painterly skill and vision [...] enabled her to give form to a Pacific mythos that was so carefully distilled in her imagination". 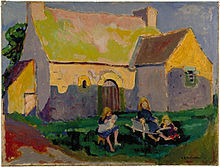 Her painting can be divided into several distinct phases: her early work, before her studies in Paris; her early paintings under the Fauvist influence of her time in Paris; a post-impressionist middle period before her encounter with the Group of Seven; and her later, formal period, under the post-cubist influences of Lawren Harris and American artist and friend, Mark Tobey. Carr used charcoal and watercolour for her sketches, and later, house paint thinned with gasoline on manila paper. The greatest part of her mature work was oil on canvas or, when money was scarce, oil on paper. On November 28, 2013, one of Carr's paintings, The Crazy Stair (The Crooked Staircase), sold for $3.39 million at a Toronto art auction. As of the sale, it is a record price for a painting by a Canadian female artist. In 1937, Carr suffered her first heart attack she is also remembered for her writing, again largely about her native friends. In addition to Klee Wyck, Carr wrote The Book of Small (1942), The House of All Sorts (1944), and, published posthumously, Growing Pains (1946), Pause, The Heart of a Peacock (1953), and Hundreds and Thousands (1966). Some of these books are autobiographical and reveal Carr as an accomplished writer. Criticisms have been made of her dramatized short stories as many readers expect them to be historically accurate. Carr's life itself made her a "Canadian icon", according to the Canadian Encyclopedia. As well as being "an artist of stunning originality and strength", she was an exceptionally late bloomer, starting the work for which she is best known at the age of 57 (see Grandma Moses). Carr was also an artist who succeeded against the odds, living in an artistically unadventurous society, and working mostly in seclusion away from major art centers, thus making her "a darling of the women's movement" (see Georgia O'Keeffe, whom she met in 1930 in New York City). Emily Carr brought the north to the south; the west to the east; glimpses of the ancient culture of the indigenous peoples of the Americas to the most newly arrived Europeans on the continent. In 1952, works by Emily Carr along with those of David Milne, Goodridge Roberts and Alfred Pellan represented Canada at the Venice Biennale. In the 1960s her works were exhibited at Galerie L'Art français. On February 12, 1971 Canada Post issued a 6¢ stamp 'Emily Carr, painter, 1871–1945' designed by William Rueter based on Carr's Big Raven (1931), held by the Vancouver Art Gallery. On May 7, 1991, Canada Post issued a 50¢ stamp 'Forest, British Columbia, Emily Carr, 1931–1932' designed by Pierre-Yves Pelletier based on Forest, British Columbia (1931–1932), also from the Vancouver Art Gallery collection. In 2014–2015, the Dulwich Picture Gallery in south London hosted a solo exhibition, the first time such show was held in Britain. In 1994, the Working Group for Planetary System Nomenclature of the International Astronomical Union adopted the name Carr for a crater on Venus. The Carr crater has an approximate diameter of 31.9 kilometers. A complete illustrated artist's biography of Emily Carr emphasising both her life and the development of her art is Emily Carr: A biography by Maria Tippett, Oxford University Press, 1979 (ISBN 9780887847561). Tippett's biography won the Governor General's Award for English-language non-fiction in 1979. Several biographies have been published of Carr's life with unsubstantiated speculations. Novelist Susan Vreeland's 2004 The Forest Lover brings in characters that did not exist in Carr's life, as well as factually recounting incidents that may not have happened. The book is a novelisation, not biography, based on events from Carr's life, using Emily Carr as the main character/protagonist and altering some characters and chronology for the purpose of pacing. Each part of the novel is introduced by a reproduction of a Carr painting. ^ a b Morra, Linda M. (2005). "Canadian Art According to Emily Carr". Canadian Literature. 185: 43–57. ISSN 0008-4360. ^ Braid (2000), p. 13. ^ Braid (2000), pp. 15–16. ^ a b c d e f Kirkwood,, Walker, Stephanie. This woman in particular : contexts for the biographical image of Emily Carr. James, William Closson,. Waterloo, Ontario. ISBN 9780889205659. OCLC 923765615. ^ "Siblings of Emily Carr". web.archive.org. May 26, 2013. Retrieved March 10, 2019. ^ Braid (2000), pp. 55–56. ^ a b c Tippett, Maria (1979). Emily Carr: A Biography. Toronto: Oxford University Press. pp. 49–50. ^ Braid (2000), pp. 61–63. ^ Braid (2000), p. 66. ^ Baldissera (2015), p. 9. ^ Shadbolt (1979), p. 38. ^ Shadbolt (1990), p. 40. ^ a b Shadbolt (1990), p. 42. ^ Shadbolt (1990), p. 52. ^ Shadbolt (1990), p. 53. ^ Shadbolt (1990), p. 58. ^ a b Walker (1996), p. 114. ^ Carr (2005), p. 457. ^ Baldissera (2015), p. 36. ^ Shadbolt (1990), p. 182. ^ Shadbolt (1990), p. 70. ^ "First European solo show of one of Canada's best-loved artists" (Press release). Dulwich Picture Gallery. Retrieved December 11, 2018. ^ Emily Carr House. Canadian Register of Historic Places. Retrieved November 13, 2011. ^ "Emily Carr, the Artist". Emily Carr University of Art + Design. Retrieved December 11, 2018. ^ "Emily Carr Branch". Greater Victoria Public Library. Retrieved December 11, 2018. ^ "About Us". Emily Carr Elementary School. Vancouver School Board. Retrieved December 11, 2018. ^ "Our School". Emily Carr MS. Ottawa–Carleton District School Board. Retrieved December 11, 2018. ^ "Emily Carr - The Artist". Emily Carr Public School. Thames Valley District School Board. October 4, 2018. Retrieved December 11, 2018. ^ "School History". Emily Carr Public School. Toronto District School Board. Retrieved December 11, 2018. ^ "School Information". Emily Carr PS. Halton District School Board. Retrieved December 11, 2018. ^ "Emily Carr Inlet". BC Geographical Names. ^ "Writing Other Lives". Times Colonist. November 18, 2007. Retrieved December 11, 2018 – via PressReader. ^ The 2011 unpublished thesis,"Canadian Artist Emily Carr: A Psychoanalytic Portrait," by Phyllis Marie Jensen, PhD, was accepted by the International School of Analytic Psychology in Zurich. Appelhof, Ruth Stevens (1988). The Expressionist Landscape: North American Modernist Painting, 1920–1947. Birmingham Museum of Art. p. 60. ISBN 978-0-2959-6691-5. "Big Raven". Canadian Postal Archives Database. February 12, 1971. Archived from the original on January 1, 2013. Retrieved July 22, 2015. Baldissera, Lisa (2015). Emily Carr: Life & Work (PDF). Art Canada Institute. ISBN 978-1-4871-0044-5. Archived from the original (PDF) on October 7, 2015. Braid, Kate (2000). Emily Carr: Rebel Artist. Toronto, Ontario: XYZ Éditeur. ISBN 978-0-9683601-6-3. Breuer, Michael; Dodd, Kerry Mason (1984). Sunlight in the Shadows: The Landscape of Emily Carr. Toronto: Oxford University Press. p. VIII. ISBN 978-0-1954-0464-7. Carr, Emily (2005). Growing Pains: the Autobiography of Emily Carr (print ed.). Vancouver, British Columbia: Douglas & McIntyre. p. 430. ISBN 1-55365-083-2. .
"Carr, Emily National Historic Person". Directory of Federal Heritage Designations. Parks Canada. March 15, 2012. Archived from the original on October 17, 2015. Retrieved October 2, 2013. "Carr on Venus". Gazetteer of Planetary Nomenclature. Flagstaff, Arizona: International Astronomical Union (IAU) Working Group for Planetary System Nomenclature (WGPSN). October 1, 2006. Retrieved July 22, 2015. 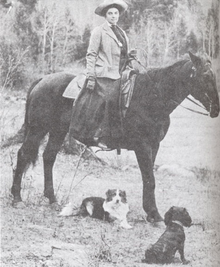 "Emily Carr: A Biographical Sketch". Vancouver Art Gallery. Retrieved April 21, 2010. "Emily's Siblings". Emily Carr: At Home and at Work. BC Heritage Branch, Province of British Columbia. Archived from the original on May 26, 2013. Retrieved February 18, 2013. "Forest". Canadian Postal Archives Database. May 7, 1991. Archived from the original on January 1, 2013. Retrieved July 22, 2015. "Galerie L'Art français, 370 ouest, rue Laurier". Vie des arts (in French) (n°30): 40. Spring 1963. "Governor General's Literary Awards". Canada Council for the Arts. Government of Canada. Archived from the original on October 4, 2013. Retrieved August 6, 2013. Holmlund, Mona; Youngberg, Gail (2003). Inspiring Women: A Celebration of Herstory. Coteau Books. p. 216. ISBN 978-1-55050-204-6. Lamoureux, Johanne (2006). "The Other French Modernity of Emily Carr". In Thom, Charles C.; Hill, Ian MacEwan (eds.). Emily Carr: New Perspectives on a Canadian Icon. Douglas & McIntyre. pp. 43–61. ISBN 978-1-55365-173-4. .
Shadbolt, Doris (1979). The Art of Emily Carr. Toronto, Ontario: Douglas & McIntyre and Clarke, Irwin & Company. Shadbolt, Doris (1990). Emily Carr. Vancouver, British Columbia: Douglas & McIntyre. ISBN 0-295-97003-0. Shadbolt (June 23, 2013). "Emily Carr". Canadian Encyclopedia. Historica Canada. Retrieved July 21, 2015. Slaughter, Graham (November 28, 2013). "Emily Carr painting sells for $3 million at Toronto auction". Toronto Star. Retrieved July 21, 2015. "Past Canadian Exhibitions". National Gallery of Canada at the Venice Biennale. National Gallery of Canada. Archived from the original on October 13, 2013. Retrieved October 12, 2013. Vreeland, Susan (February 2004). The Forest Lover. Viking Press. ISBN 978-0-670-03267-9. Walker, Stephanie Kirkwood (1996). This Woman in Particular: Contexts for the Biographical Image of Emily Carr. Waterloo, Ontario: Wilfrid Laurier University Press. ISBN 978-0-88920-263-4. Crean, Susan. (2001). The Laughing One: A Journey To Emily Carr. Toronto: HarperCollins Flamingo. ISBN 978-0-00200-062-8. Marchessault, Jovette. (1992). The Magnificent Voyage of Emily Carr. Vancouver, BC: Talonbooks. ISBN 978-0-88922-314-1. Moray, Gerta. (2006). Unsettling Encounters: First Nations Imagery in the Art of Emily CarrUBC Press. ISBN 0774812826. Orford, Emily-Jane Hills. (2008). "The Creative Spirit: Stories of 20th Century Artists". Ottawa: Baico Publishing. ISBN 978-1-897449-18-9. Reid, Dennis. (1988). A Concise History of Canadian Painting 2nd Edition. Toronto: Oxford University Press. ISBN 0-19-540663-X. Tippett, Maria. (1979). Emily Carr: A Biography, Toronto: Oxford Univ. Press. ISBN 0-19-540314-2. Udall, Sharyn Rohlfsen. (2001). Carr, O'Keeffe, Kahlo: Places of Their Own, Yale University Press. ISBN 978-0-300-09186-1. Wikimedia Commons has media related to Emily Carr. The full text of some of Emily Carr's books is available from Project Gutenberg of Australia. Several dozen Emily Carr artworks are viewable through the collection of the Art Gallery of Greater Victoria.